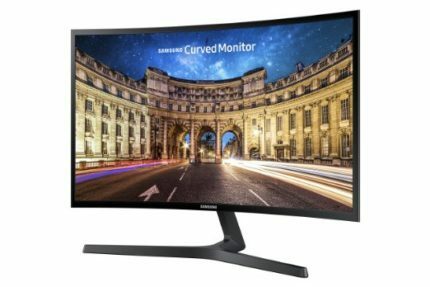 The Samsung C27F398 is a 27-inch monitor that features a widescreen display that curves to wrap around the user, creating an immersion experience for gaming, working, and viewing multimedia. The curve of this screen measures to a radius of 1800 mm, creating a curve around the user and drawing you into the world of your movies or games, or even photographs and office work. The Full HD screen eases the strain on the eyes and looks fantastic on your desk even when its display functions are not in use. You could compare this screen experience to an Imax theater, minus the crowd and the price of a ticket! Elegant in its design and pragmatic in its functionality, this monitor serves as a multipurpose ticket to computing experiences. The Samsung C27F398 PC monitor supports almost seventeen million colors in its display, making use of Samsung’s proprietary Active Crystal Color Technology. The Vertical Alignment (VA), panel type may render this display ineffective for pursuits in precision color is critical, but these panels do splendidly in displaying deep levels of black and a high contrast ratio of 3000:1. An advantage of the VA panel, as compared to IPS technology, is the lack of light leakage. The blacks are deeper, whites more brilliant. In essence, colors richer and more vibrant. For a user who is working or playing, gaming or watching videos, the sensation of surround view provided by this curved screen is almost like an Imax screen for quality. The 1800R screen has the deep curve of the screen to allow you to fully immerse yourself in all the media content you enjoy while reducing eye strain by providing a smooth tracking experience for eyes moving across the display. Some users find that the curvature distracts from straight-line tasks like spreadsheets or photo cropping, so determining whether the curved screen is an asset or a liability may depend in part on what job is being undertaken. 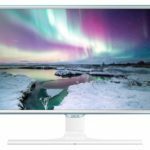 If you are considering a purchase of this monitor, it may be worth your while to sit down with a curved screen and give it a “test drive” to see whether it suits you and your predominant uses of the computer. Along with the specialized Gaming mode, the AMD FreeSync technology works to synchronize the frame rate output from your graphics card to match the refresh rate of the monitor, enabling you to experience smooth gaming without any lag, hosting, stuttering, or skipping frames. Combined with the quick response time of 4 ms, gaming is enjoyable and smooth, lacking ghosting and blurring. This is a feature unique to the Samsung line, and it makes gaming on a Samsung monitor an immersive experience without the interruptions of technical difficulties or interrupted visuals. This monitor model includes a Game Mode intended to optimize contrast and colors for outstanding experiences in gaming and multimedia use. Not only do desktop and laptop computers connect to this monitor, but gaming consoles as well. Another mode, in addition to the specialized Game Mode, is the Eye Saver Mode. With the touch of a button, the user can reduce the occurrence of flickering and emissions of blue light, which cause eyestrain over long periods of screen time. With eye saver mode, you might be able to save yourself a headache, fatigue, and eyestrain attendant on long sessions of screen time. The Eco-Saving Plus enables the user to activate different levels of power saving. With environmental standards in mind, this monitor is constructed without PVC (except where it is used in separate cables), and it is ranked and certified as an Energy Star power saver.If power use is a concern, you will be glad for the features that automatically save power by reducing screen brightness. In addition to the Eco Saving Plus and Eye Saver mode, the Samsung C27F398 display also includes trademarked features like Samsung MagicBright, Samsung MagicUpscale, Flicker Free, Game Mode, and FreeSync. 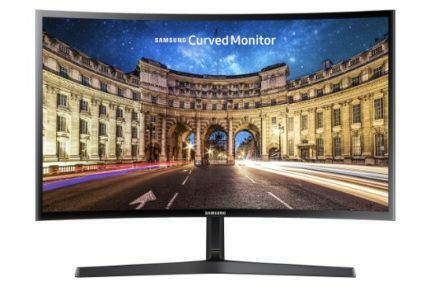 Like their counterpart flat screen monitors, Samsung C27F398 FreeSync monitor can be connected to a computer in conjunction with another monitor; depending on the set-up, this could create a very real surround-sound and picture environment. With its slim profile and sleek, curvy design, the Samsung CF398 adds class and elegance to any desk. The body of the monitor measures less than half an inch in width, with the footprint space being correspondingly minimal. A user sitting in front oft his screen will experience the wrap around sensation of being entirely engulfed in whatever game or multimedia experience they undertake. Additionally, research has shown that the curved shape, echoing the natural shape of the eyes themselves, can reduce strain during long stints at the screen. Perched on an elegant and simple gloss black stand, the screen itself is framed by a glossy bevel, its clean lines marred only by the cables from the back. The streamlined stand of the Samsung C27F398 comes complete with tilting capability for adjustment. It is also fitted with VESA Mountable compatibility, should you choose to mount the screen on a different stand, or on a wall or other vertical work surface. This model is somewhat limited in its ports, providing only for VGA and HDMI cables unless a user chooses to add an adapter for additional cable types like DP or USB inputs and outputs. Because the monitor does not have DP in and out ports, each monitor would have to connect individually to the computer, rather than linking a “daisy chain” from one monitor to the other. This involves more cords and cables; the specialty functionality of dual screens can certainly be achieved with this model of monitor. A headphone or speaker jack is also available, allowing the user to incorporate a sound system for gaming, video viewing, music, real-time gaming interactions, and other multimedia use. As with any hardware purchase, a prospective buyer should take into consideration the activities for which they expect to put the monitor to use and the equipment to which they are likely to connect it. The Samsung C27F398 VA monitor does not have VGA or connectivity for handheld devices, although a user can introduce an adapter to fill some of those functions. Connected with a digital cable, the picture quality of the Samsung C27F398 monitor is unrivaled in its class. The 1800R screen has the deep curve of the screen to allow you to fully immerse yourself in all the media content you enjoy. The Samsung C27F398 1080p curved monitor provides a terrific picture quality and all-around experience. The types of activities you engage in will be a determining factor in whether this screen is for you. 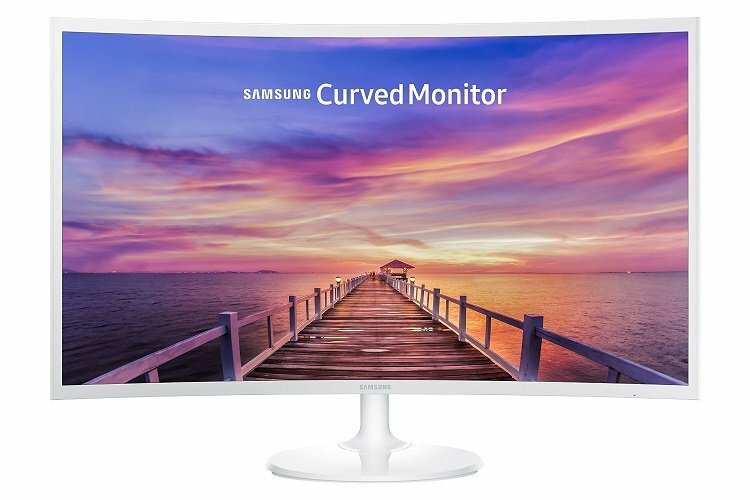 If the resolution and refresh rate suit the functions for which you want the monitor, the curvature of the screen is certainly a bonus compared to other monitors in the same class. For any user who is professionally or heavily involved in the photo or video editing, a higher resolution with more pixels might be preferable for enhanced picture quality. 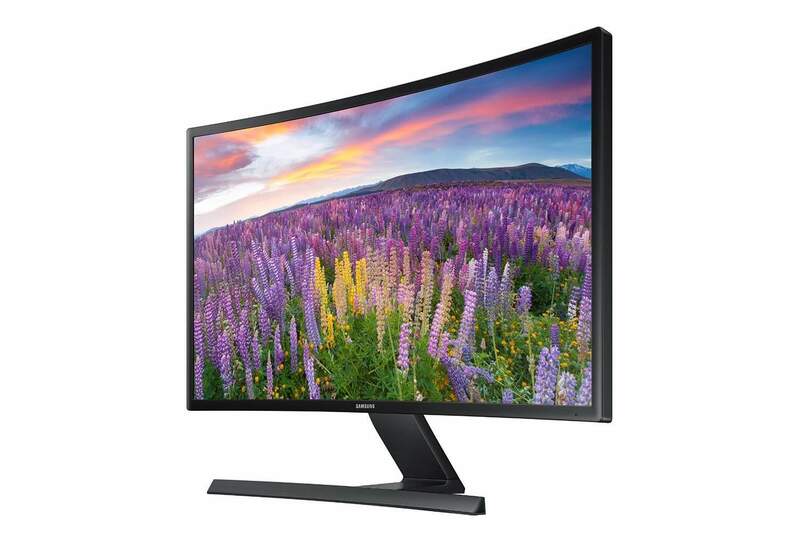 Short of professional photography, however, the high quality curved screen of the Samsung C27F398 monitor provides a positive experience for a wide variety of computer and gaming activities. The Samsung C27F398 offers a curved screen for an amazing multimedia experience with its beautifully designed monitor for a very reasonable price. The FreeSync and gaming modes make it ideal for gamers who wish to immerse into gaming like never before. Please change this in the article as you are just confusing those of us checking the reviews vs the items seen on both amazon websites.